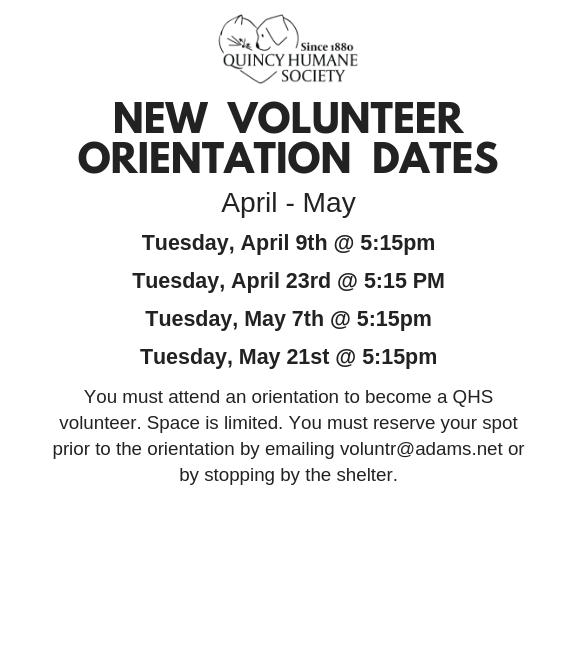 The Quincy Humane Society is always accepting volunteers. Volunteers help us with a variety of tasks around the shelter, assist with community outreach events, and are an integral part to our mission! If you are under the age of 16 and are interested in volunteering, you may do so under the supervision of an adult. Both the adult and the child must go through the training process. Current Volunteers: Log into Better Impact here! 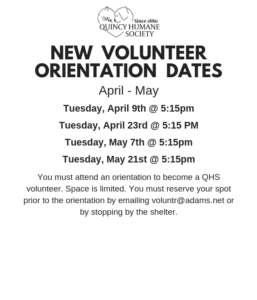 The first step to becoming a volunteer at the Quincy Humane Society is to attend a New Volunteer Orientation, where you will learn all about the Quincy Humane Society and our Volunteer Program. You can find the current orientation dates at the bottom of this page. Q: What sorts of things do volunteers do while at the shelter? A: Volunteers help us with walking dogs, socializing dogs, training dogs, socializing cats and kittens, assisting with cleaning and laundry, and much more! When you come to volunteer, you can choose which area you’d like to help in. 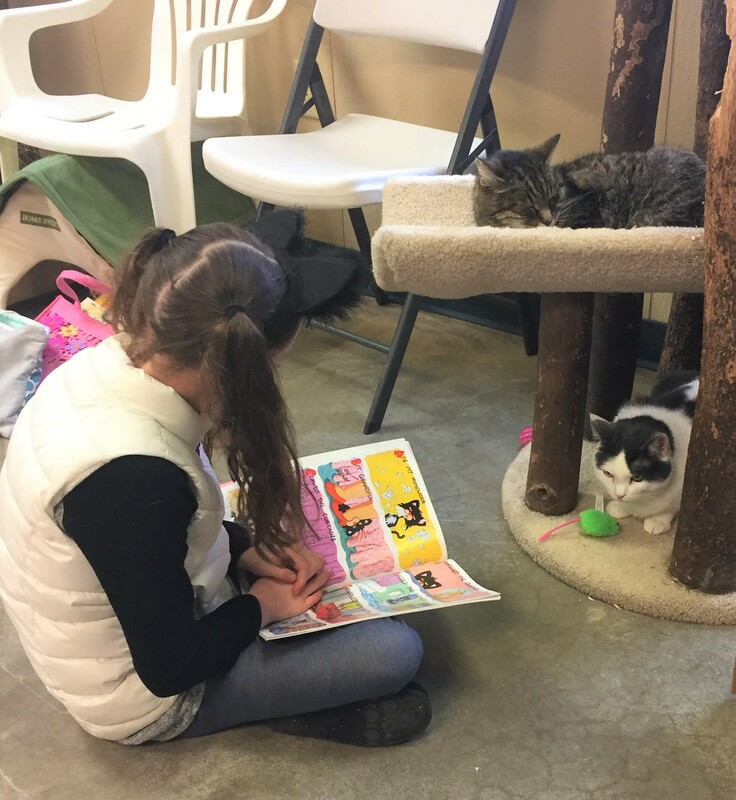 Our favorite thing for volunteers to do at the shelter is animal socialization. Our staff works hard to ensure all of our animals are kept clean, safe and healthy – but we love for volunteers to help us with the fun stuff! Q: How old do you have to be to volunteer? A: There is no age limit, but we do have several limitations for volunteers under the age of 16. Volunteers under the age of 16 are required to have an adult present with them while volunteering. An adult can only be accompanied by 2 minors at a time. Q: Is it possible to job shadow a Quincy Humane Society employee? A: Because of the nature of the work we do, we do not generally offer job shadowing opportunities. However, in rare cases if a student is studying to be a veterinary technician or planning to pursue a career in veterinary science, we can make exceptions. Q: Can individuals come out to volunteer on a one-time-only basis? A: Unfortunately, we require all volunteers to go through a training process prior to volunteering at the shelter. This training provides skills in animal handling, shelter safety, and the important rules we have set in place to keep our shelter animals as healthy as possible. Because of this, we do not allow individuals to come out and volunteer for one time. We do allow one-time volunteers for our large fundraising events, like The Fabulous Fur Ball and Mutt Strut. Q. Can groups come in for a service day or service project? A: We do welcome groups and organizations to schedule service days or service projects. We ask that these opportunities are scheduled in advance so we can plan projects ahead of schedule. Q: Can I volunteer at any time? A: Volunteers, who have gone through the training, are welcome to come out and help anytime we have staff at the shelter. As long as you are staying busy and helping, you are able to volunteer as long as you would like! Q: I would like to do other things besides helping at the shelter. What other opportunities are available? A: There are many things we need help with! We are always looking for foster homes for puppies and kittens – temporary homes for animals before they come into the shelter and for our community outreach events! Community outreach events include pet visits with the elderly and local schools, information tables, kids’ events, adoption events and fundraisers! We love volunteers with special skills – if you enjoy doing something in particular that can be done here, let us know and we can arrange something! Q: I have court appointed community service hours. Can I complete those at the Quincy Humane Society? A: We do accept court appointed service hours at the shelter. Those seeking hours must talk to the Community Relations Manager before beginning those hours. 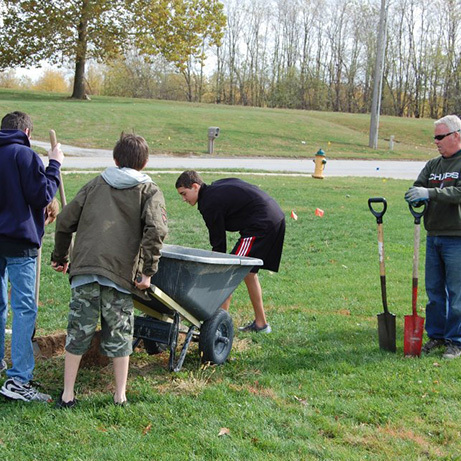 Individuals completing community service hours must complete tasks outside the typical volunteer responsibilities. Please contact the Community Relations Manager for more information. Want to find your forever friend? Learning more about our shelter and our upcoming events, join our mailing list today! How can you help the Quincy Humane Society? We are in need of volunteers, household items, and donations. Please click here to find out more about how you can help our shelter.